I love getting out and about to talk to budding young writers. While my books are primarily aimed at ages 8+ I can offer a variety of sessions for a wide range of ages and skill levels. If you’d like me to stay for the day, or the afternoon, I can deliver an assembly, then run creative writing exercises in class. All sessions can be extended depending on the amount of interaction and inclusion of Q&A sessions. Feel free to get in touch for a chat about what I can offer your school or event. I’d love to hear from you! Fees charged are in line with the rates listed by The Society of Authors. 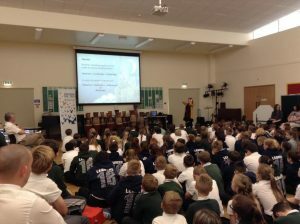 Please view the link for guides on making the most of an author visit.